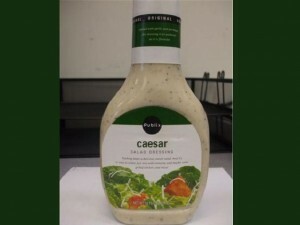 Ken’s Foods Incorporated, the producer of Publix’s Caesar Salad Dressing, has announced a product recall for the salad dressing on June 16. The salad dressing possibly contains gluten, fish and soy ingredients which have not been declared on the label. The recall was announced immediately after it was found that a part of the run contained a wrong back sheet label. The labels did not indicate that fish, soy and gluten were part of the ingredients. The affected salad dressing has a net weight of 16 ounces and expires on March 31, 2012, as indicated on the product’s label. The recalled product may possibly have the wrong ingredients printed. The correctly labeled products have a UPC code of 4141500730. Fish, gluten and soy are among the most common food allergens. People who have known allergies to these foods should avoid any type of food product containing the allergens in order to avoid triggering an allergy attack. Currently, no reports have been made about allergy attacks connected to the dressing. The recalled product was sold in various Publix stores in the states of Florida, Tennessee, South Carolina, Georgia and Alabama. To ensure consumer safety, Publix is asking all their customers who bought the recalled product to return it to the Publix store that they bought it from and they will receive a refund for the product. Instead of a refund, they can also ask for a product replacement. For any questions and concerns, customers may call 1-800-242-1227, Publix’s toll free number. Customer service representatives will be able to assist them from Monday to Friday, 8:00AM until 5:00PM Eastern Time.